This is Pavoni Gallery is just getting started. 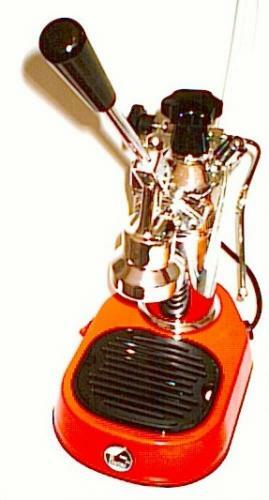 If you have an unusual Pavoni, please contact me to have your photographs displayed on this site. 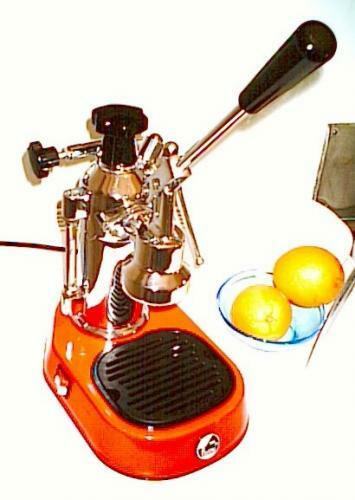 There are three basic Pavoni models that I know of: the Europiccola, the Ambassador, and the Professional. The Europiccola is the basic model. It has a 12-cup tank. The Ambassador sports a larger, 16-cup water tank. I prefer the Ambassador because the larger tank needs less frequent refilling. I am not sure that the Ambassador is still in production. The Professional is outfitted with a pressure gauge and substitutes the Europiccola and Ambassador manual temperature control button with an automatic temperature sensor. So far, the consensus is that the pressure gauge is mainly ornamental. If you follow the rules below, you don't need a gauge. In any event, the gauge is available separately as an accessory and is easy to add to the Pavoni. The temperature sensor is a matter of some debate. It may or may not be a good idea. I have no experience with it, but you always give up security when you opt for freedom. The Professional, it must be emphasized, is "professional" in name only. It is a home machine. Pavoni does make professional machines, but they are different beasts altogether. I know nothing about the merits of these, except that at Gio Ponti designed one. Thomas Luby sends photos of this Europiccola "Ferrari" limited edition, a normal Europiccola with a beautiful red base.